This year marks the 100th Anniversary of the National Park Service. Woodrow Wilson created the National Park Service on August 25, 1916. We know a lot of you will want to take some trips out to some of our national parks, whether that is our local Shenandoah National Park or Blue Ridge Parkway, or visiting some other parks like Yellowstone, Yosemite, or the Grand Canyon. We recently picked up a few books to review and thought these were all great resources in planning your next adventure. This book is the ultimate companion to the national parks. The book is broken down into regions of the country (color-coded at the bottom) and alphabetized by park name within each region. Each park covered includes a map of the region and a brief history of the park. They also point out highlights of each park, camping and lodging available, and information on hikes you won’t want to miss. 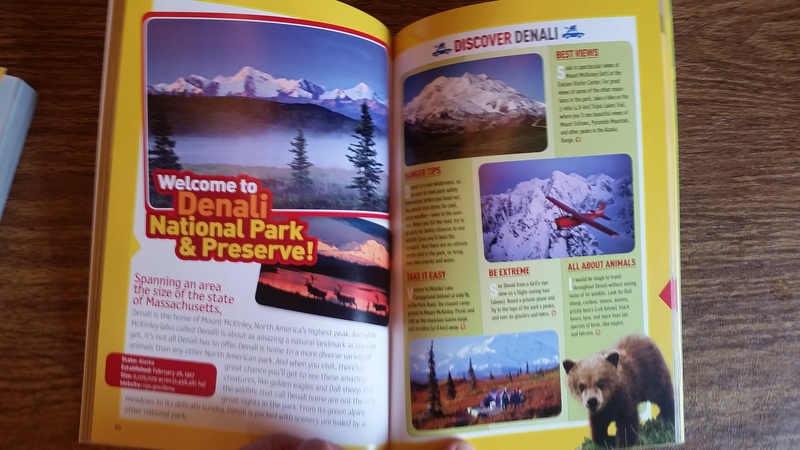 Many of the park write-ups also include information on other excursions within the area. They also feature for each park advice on how to visit the park – understanding how many days you should take explore the area and the best season can help you make some great decisions on how to make the most of your trip. Of the parks we have visited, I found their write-ups spot on and the photography is always magnificent. This book has a ton of information packed into its near-500 pages and after flipping through for a short while, you will want to plan many vacations to parks you haven’t seen yet (or plan another trip on all the things you may have missed. 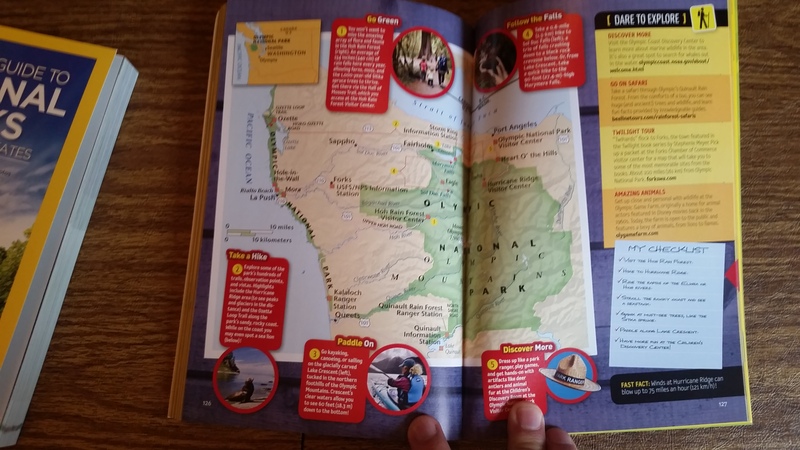 While you are looking through the official National Geographic Guide, this book is a great companion guide for your kids. I would gauge this is more geared towards kids that fall within the late elementary school to early high school ages. The material is definitely more condensed, but does include a map of each park. For each write-up there is information on Ranger Tips, Take It Easy (for relaxing ideas), Be Extreme (for adventurous ideas from white-water rafting to caving to paragliding), Best View, and All About Animals. Each of the write-ups also include a checklist, so parents can help them work towards those goals to take in the most out of each park. And because both of these books are done by National Geographic, you know the photography will be amazing. This book would also be a great thing to buy for your kids to teach them about the National Park Service and all the features these parks provide. While the first two books give you a wonderful overview of each park, Backpacker put together this 385 page book that give you expert advice on specific hikes within each park. For most of the parks listed, there are 1-5 hikes selected. Most of the ones with more than one hike are larger, more popular destinations like Grand Canyon, Mount Rainier, Olympic, or Zion. Some of the hikes listed are simple day hikes, but the bulk are backpacking trips that can be just a simple overnight to a week-long adventure. Each of the hikes covered include a detailed map and GPS coordinates along the way, which should give you the precise information you need to start your hike. . Distance, time required, contact information, difficulty, and trailhead directions are listed at the beginning of each hike. This book has the ultimate thrill-seeker in mind and if you have a sense of adventure and wanting to get deep into the beauty of each park, they have provided some excellent advice. While I feel I won’t be able to do but a percentage of what is covered in this book, every one of these could be considered a bucket-list adventure. The photography is also amazing, with a big splash page for each park. 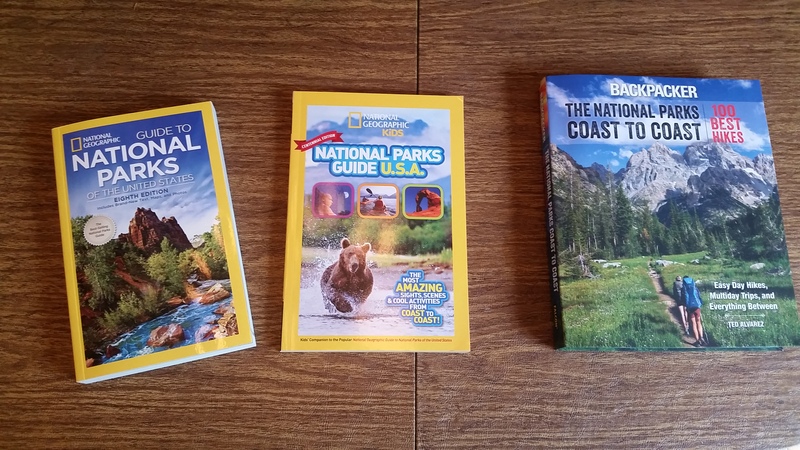 We also learned that National Geographic is celebrating the 100th anniversary of our National Parks Service by offering the chance to win a spectacular family vacation for four to Grand Canyon, Bryce, and Zion National Parks. Here are the details and a link to the enter which will be live on April 1st. And if anyone wins this vacation, Christine and Adam would be glad to be adopted into your family for this adventure.